Southern Australia has been in the news lately because of their massive brush fires and the tragic loss of life and homes for those caught in the path of the fire. To date more than 200 people have died and 1800 homes destroyed. It is also upsetting to learn that the fires had been deliberately set. OrangeTractorTalks reader Keith posted a picture of a Kubota L1801 in our gallery that was involved in those fires. Keith helps run a Kubota restoration and refurbishing shop in Australia and a client had their equipment burned up by the fire. 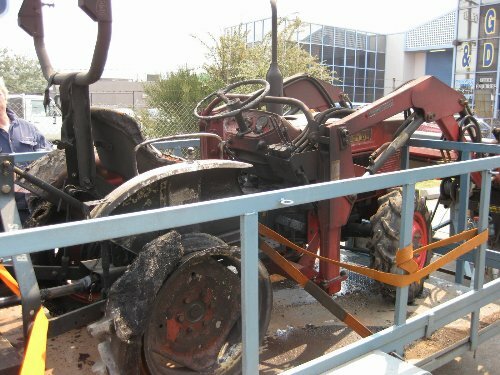 A burned up Kubota L1801 as a result of Australia's recent brush fires making the news. If you look at the full resolution photo, you can see the bubbling on the dashboard, the melted steering wheel, the FEL control knobs are all gone and the rear tire is basically just a rim. Incredibly, Keith reports that the Kubota was still running in this state and they drove it onto the trailer under its own power. I’ve asked if Keith could keep us posted on the progress of this repair. I think it would be interesting to see what a full restoration looks like. Thank you for sharing Keith!